Many of my musical colleagues have heard me speak about my education and work at the University of Massachusetts, Amherst. 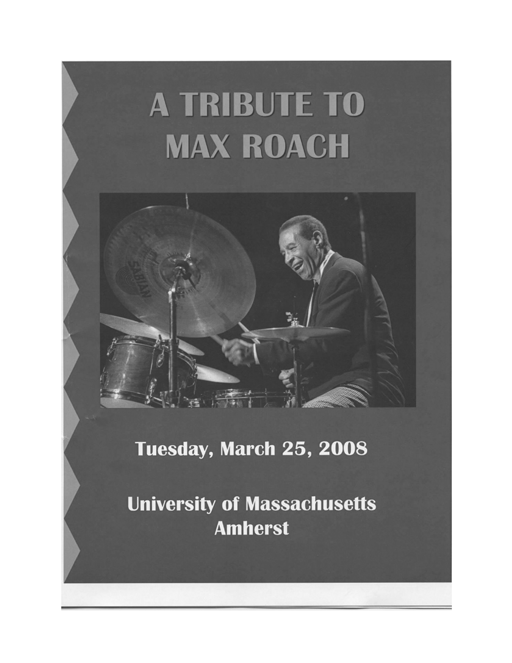 One of the greatest experiences and honors for me was working my mentors Dr. Fred Tillis, Master Percussionist Professor Max Roach and Dr. Horace Boyer and so many colleagues, students and fans. Please go to this link for a .pdf of our tribute to Prof. Roach after his passing on August 16, 2007. Tomorrow, August 16, 2018, marks the 11th year anniversary of his passing. Its totally by coincidence alone that prompted me to post this information. 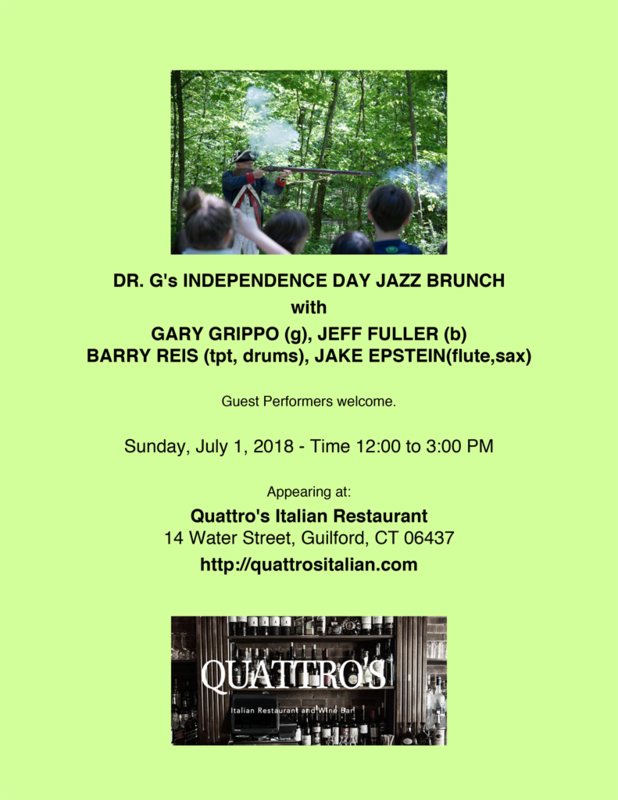 We will be performing at Quattro's Italian Restaurant in Guilford on July 1, 2018. This is part of Dr G.'s Jazz Brunch series that occurs on the First and Third Sundays of the month. Gary Grippo, Jeff Fuller, Barry Reis and Jake Epstein will be performing along with Special Guests. Guest performers welcome for the the second and third sets. Please visit https://www.quattrositalian.com for directions and additional information. Video Recordings from the May 17, 2017 performances at the Shamrock are available via the following Link. At the March 20th performance at the Shamrock in Waterbury of the Harold Zinno Big Band featuring Vocalist Amanda Bellitto, Jake Epstein anounced our developing a recording project. This will feature vocals by Amanda perforning arrangements by Jake Epstein. We hope that many our fans and friends will help by contributing and promoting the project and events assoicated with it. I had the honor and pleasure of recording on Flute with Jayne McKnack Manning this fall at Norman Johnsons' Manor Studios in Middletown. Charles Weyant (tenor Sax), Joe McWilliams (Piano), Lou Bocciarelli (Bass) and Tom Palinko (drums) were also on the date. Jayne McKnack Manning will be performing with Dr G's Brunch at "Kelly's on Crown" (196 Crown Street) in New Haven on Sunday January 16. Hope to see you there! 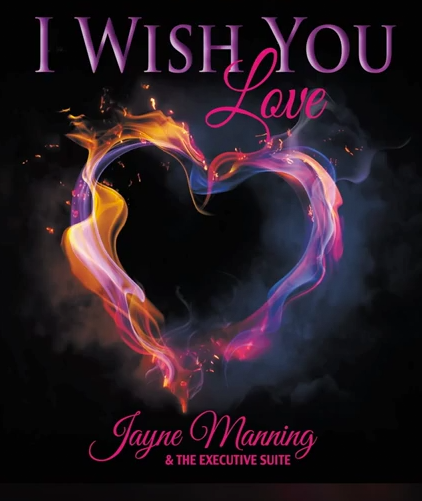 Jayne McKnack Manning's current Album is named "I Wish You Love". Its available on Cd Baby and individual tracks are available on You Tube. Check out the following Youtube link for "I'll Close My Eyes" from the CD. 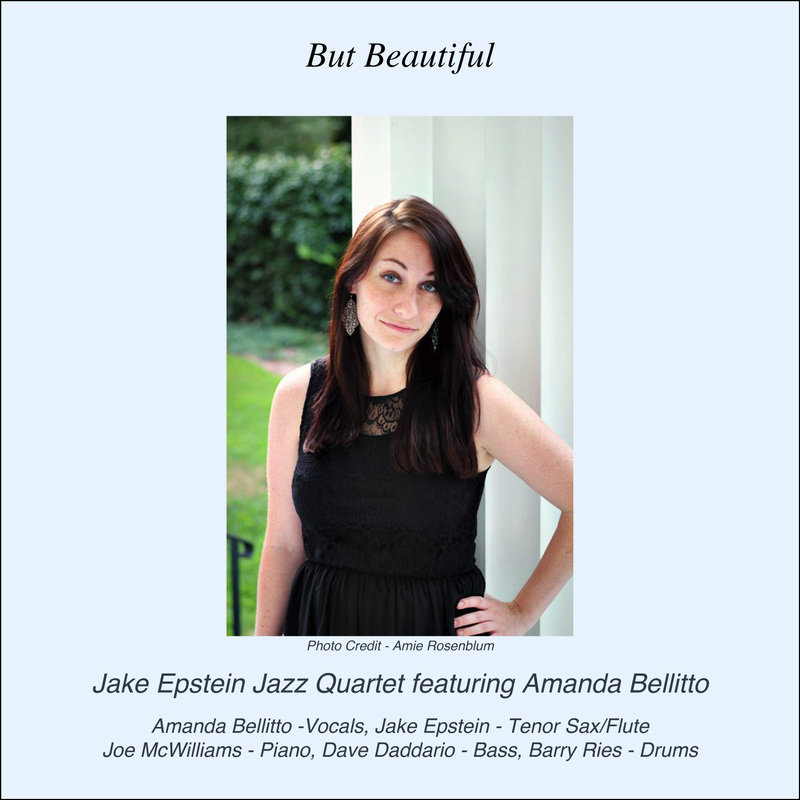 A new album by the Jake Epstein Jazz Quartet featuring Amanda Bellitto has been released. The "But Beautiful" album was record in July 2014 at the Manor Studio in Middletown CT and was release on October 1, 2014. The album is dedicated to Sheila Jordan. Our colleague, mentor, teacher, friend and inspiration. 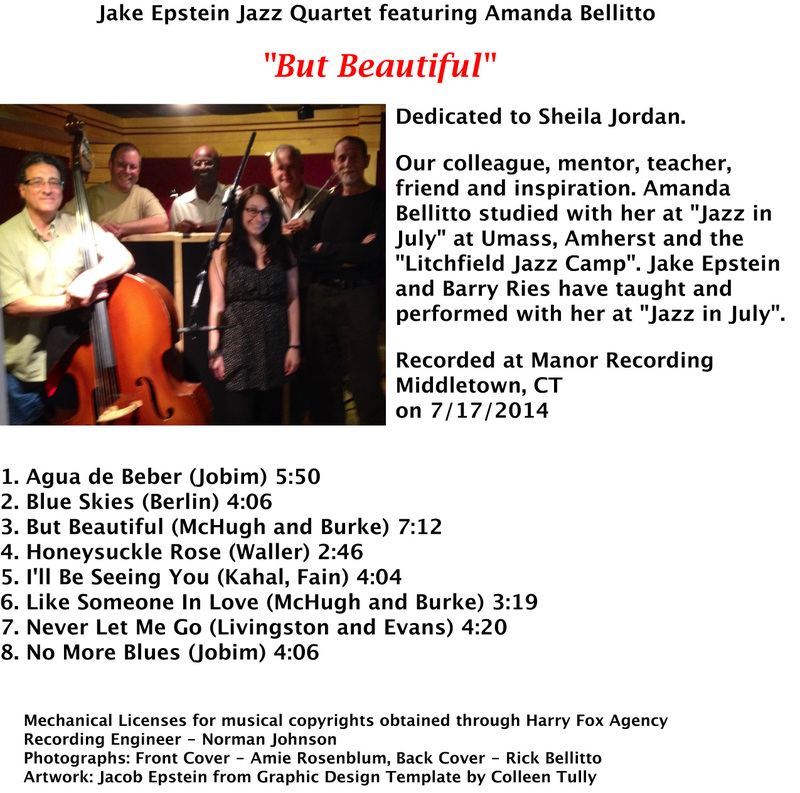 Amanda Bellitto studied with her at "Jazz in July" at Umass, Amherst and the "Litchfield Jazz Camp". Jake Epstein and Barry Ries have taught and performed with her at "Jazz in July". Sample Tracks can be heard and CDs or Digital Downloads can be purchased at CD Baby. 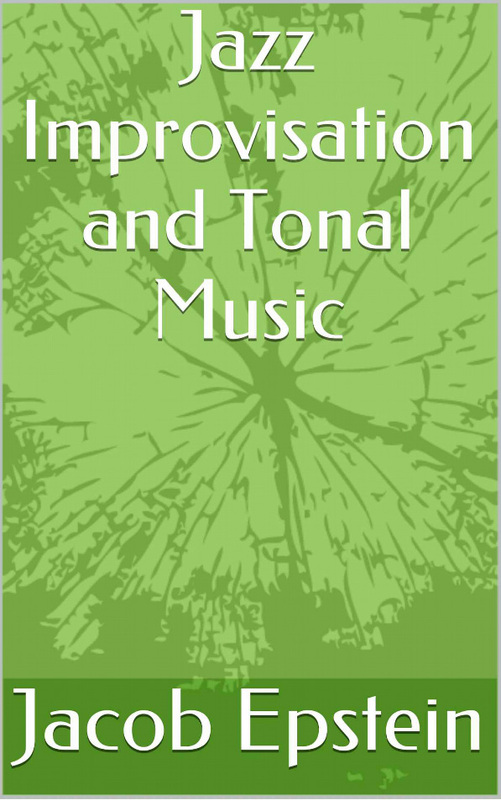 Digital Downloads are also avails for purchase at Amazon, Google Play and iTunes. A video clip with photos and sample tracks is available at Youtube. A stream of the sample tracks can be heard at SoundCloud.